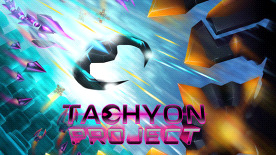 Tachyon Project is a dual stick shooter heavily inspired by classic shoot'em ups. We’ve combined many unique enemy types, a large variety of weapons and power-ups with innovative gameplay to ensure a long lasting challenge and discovery at every new level. Tachyon Project also brings new ideas to the table, presenting a new stealth mode in some levels where you have to pick carefully when to shoot to avoid being discovered too early and keep yourself disguised.